This evening I was in the mood to make a Kung Pao Chicken & Broccoli Stir-Fry. It turned out absolutely delicious. I cut up fresh broccoli florets and lightly steamed then in a small amount of water in my wok while I cut up the boneless chicken breast into chunks. If desired, you can serve it over low carb cauliflower rice, but hubby and I ate ours as is in shallow bowls topped with extra large roasted salted peanuts that I find at Costco. They are huge and super crunchy and roasted without any added oil (just peanuts and salt). I dusted my chicken chunks with finely ground peanut flour which acts like cornstarch to help keep the chunks of chicken separate and it also absorbs most of the juices as the chicken cooks so it browns and sears nicely without ending up cooking in its own juices. It isn't required but is nice to use if you have it. I buy a package of it and then keep it in the freezer to have available to use when I need it so it lasts for a long time. I added a sliced carrot, green spring onions and the steamed broccoli florets. To flavor my sauce, instead of using minced garlic and red pepper flakes separately, I simply used a tablespoon or two of my chili garlic sauce which gives you both garlic flavor and heat. If you don't want any spice, simply use minced garlic instead. I thicken my sauce, which begins with chicken stock for the liquid, with a rounded tablespoon or two of peanut butter. It works like a charm. You can make your sauce as thick or thin as you prefer. I snapped a quick photo below as well as the easy peasy recipe. Enjoy! 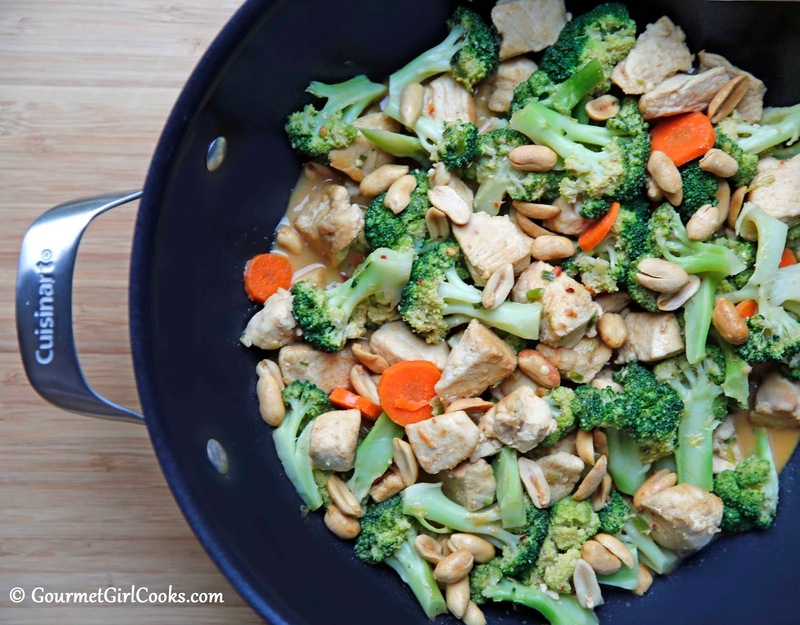 In a medium bowl, toss chicken chunks with peanut flour until they are evenly coated. In a large wok, place broccoli florets and 1/4 cup of water and heat over medium-high heat until boiling; cover and reduce heat to medium and steam for 3 to 5 minutes until broccoli is tender-crisp, or desired consistency. Drain broccoli in a colander and set aside. Carefully wipe any trace of water from the wok with a paper towel. Add coconut oil to wok and heat over medium-high heat until hot. Add chicken chunks and stir-fry until lightly browned and cooked through, about 5 to 7 minutes. Add spring onions and carrots; cook for one additional minute. Push chicken towards the sides of wok, creating a well in the center. Add 1/4 cup chicken stock and peanut butter, stirring until melted. Add chicken stock in 1/4 cup increments until the desired thickness of sauce is achieved. Add Tamari sauce, chili garlic sauce, and broccoli; stir until evenly coated. Taste for seasoning and sauce consistency. Add additional peanut butter to thicken sauce or additional stock to thin sauce. Top with roasted peanuts. Looks delicious!! I looked at the peanut flour and it said it was $205 for a 16 oz. bag?????? Surely that is wrong. LOL if that's what you saw it is most definitely wrong!!! When I looked it said $7.29 for 16 oz. The Chinese always used cornstarch to seal the meat or fowl in their stir fry dishes. The protein was shaken inside a bag or small dish to coat. It served to seal in the juices and keep the meat tender. Sometimes they used frothy egg whites as well. Hsiang Ju Lin, wife of the famous diplomat Lin Yutang, wrote several cookbooks which describe the techniques necessary as well as recipes using commonly available ingredients. One book is "The Secrets of Chinese Cooking" another is "The Art of Chinese Cuisine". You can find them on the internet at a very low cost. These books are invaluable because once you learn the technique, substitution of ingredients is simple and can be adapted to whatever you have on hand. Your peanut flour coating is a good choice. Another choice might be potato starch. I just clicked again and it does say $7.29 this time. I almost screamed when I saw thatcher high price. HA!! I knew almond flour and coconut flour were high but nothing compared to this. Looks amazing.... just called hubby and asked what he thawed for dinner and it was chicken breast... just happened to get spring onions, carrots and broccoli in my organic box this week. I know what's for DINNER!